Affordable hand-made guitars to suit your every need. We will hand build anything you want. Our commitment to excellence shows through our valued customers one guitar at a time. Loyal customers choose Jagneaux for Affordability, Craftsmanship and Experience. You’d be surprised at how affordable a Jagneaux custom guitar can be. Most orders save customers up to 50% or more! How does a master luthier make works of art so affordable? It's simple - he loves it. With little overhead, no debt and a gigging musician, John Jagneaux can easily keep costs down and still enjoy the mastery of his craft while staying in touch with what musicians really need. So why go retail or any other custom shop when you can have your cake and eat it, too – for less! All wood materials are quality cuts that are inspected to ensure not only their durability but also that their tonal and aesthetic characteristics are intact. Hardware is just as important, so we would make appropriate recommendations wherever needed. Playability is always second to none. Jagneaux guitars are built for musicians by musicians. We wouldn’t build something that we wouldn’t play ourselves. Therefore, playability, feel and sound are integral to the build process. We have the skill and experience to know what you want. Call with any questions about sound, wood, paint, hardware, frets, nut material, action, etc. We are a wealth of knowledge with over 30 years experience. Please click the picture for a larger image! 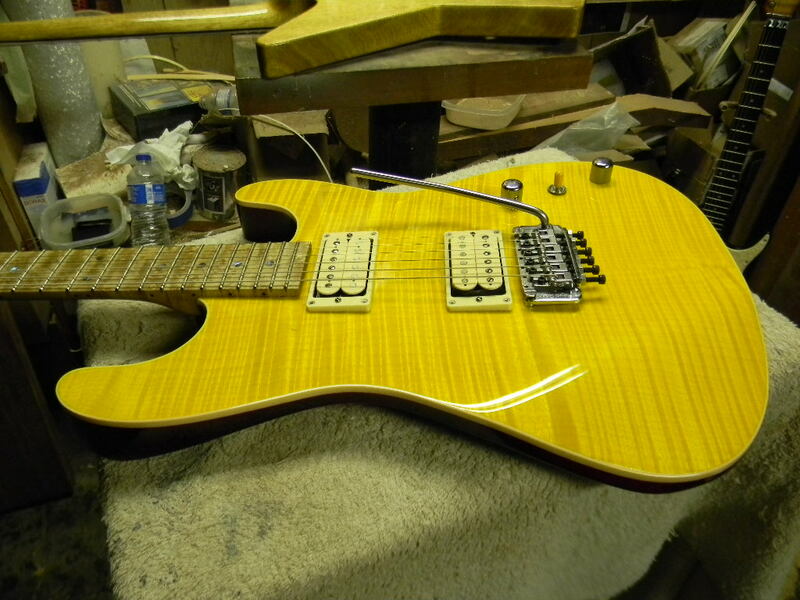 This body has a 5A flame top with a Lemon Drop stain and a Creme binding. The forearm contours are done by hand and fit to a tee. It has a non-locking vintage floyd rose floating tremolo and a very fast neck. 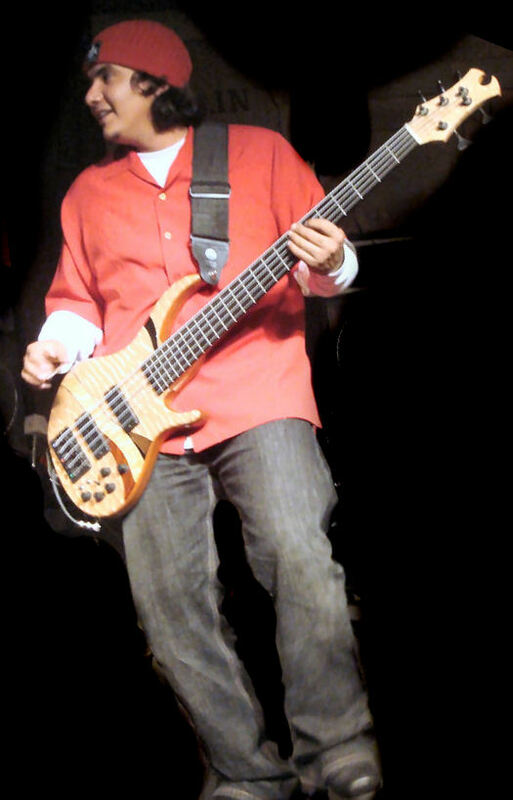 JoJo Garza from Los Lonely Boys playing a custom bass built by John Jagneaux. JoJo was a special guest in south east Texas for New Year's Eve 2007-2008. He guest starred on stage at Whiskey River alongside the Jamie Talbert Band, playing this 5 string bass. JoJo is an avid supporter and player of Hohner basses (not to mention he's endorsed through them), but he offered comment on the Jagneaux custom: "It's a very nice bass. It's comfortable and easy to play. Compliments to the builder!"